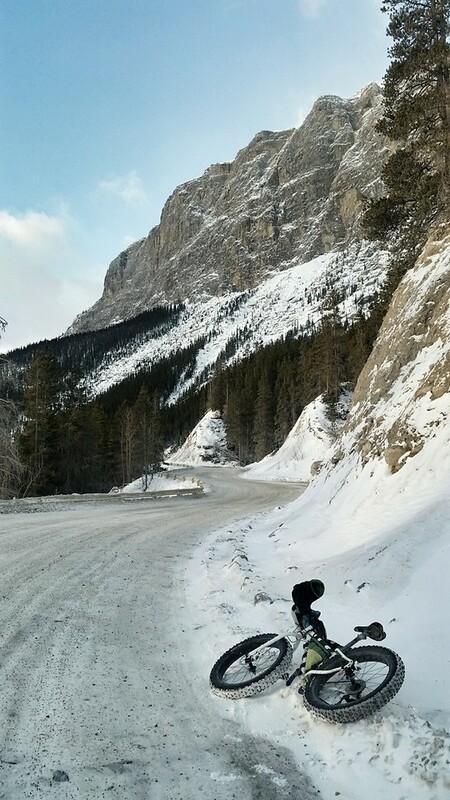 Riding the Rapha Festive 500 in Canmore seemed like a pretty sketchy idea. 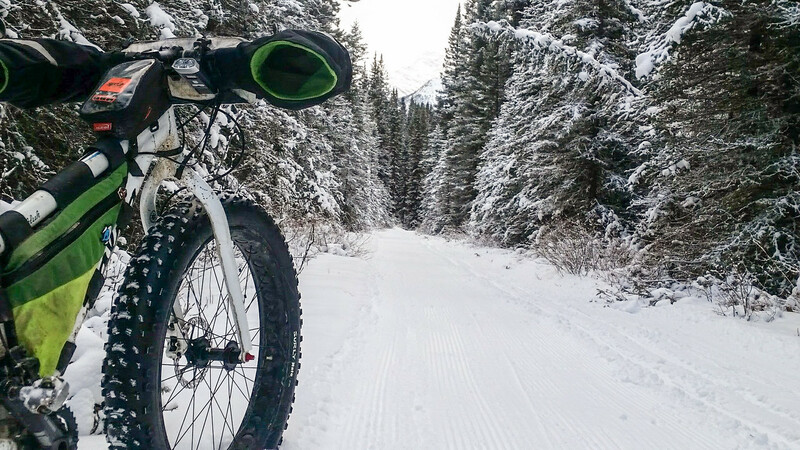 To ride your bike 500km outdoors, between Christmas Eve and New Years Eve… well, it can be hard enough when you’ve got a roadbike and no snow. 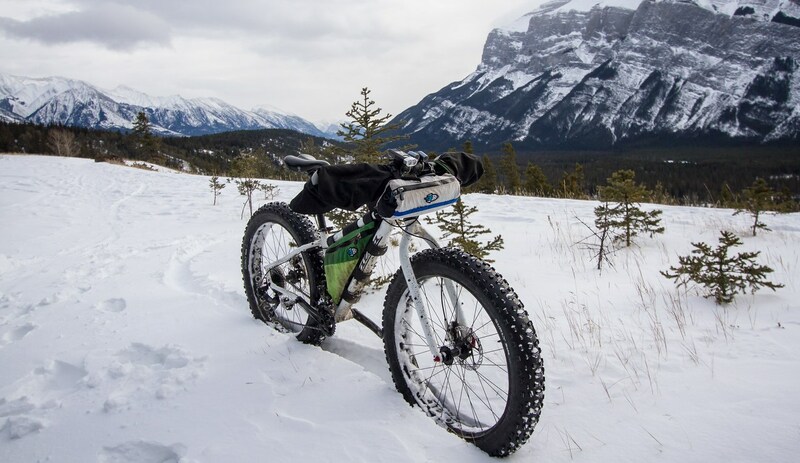 But when you decide to do it on a fatbike, riding on snow, and then add in all the other family obligations, the sub-zero temperatures, the incredibly short daylight hours, and on top of that the high likelihood of snowfall, -30oC days, and illness (because it’s just that time of year). Well, I was kind of dubious about whether the whole thing would ever pan out. But I figured I may as well try. So this is me, heading out on a nice warm lunch ride a couple of days before the Festive 500 began. Of course, it was nice and warm then. But then it got cold. And snowed. My Festive 500 began with an attempt to get in a morning ride before a day spent with family. I was tired though, and managed to get a flat tyre only 3.5km into the ride, just after hitting singletrack at the Nordic Centre. 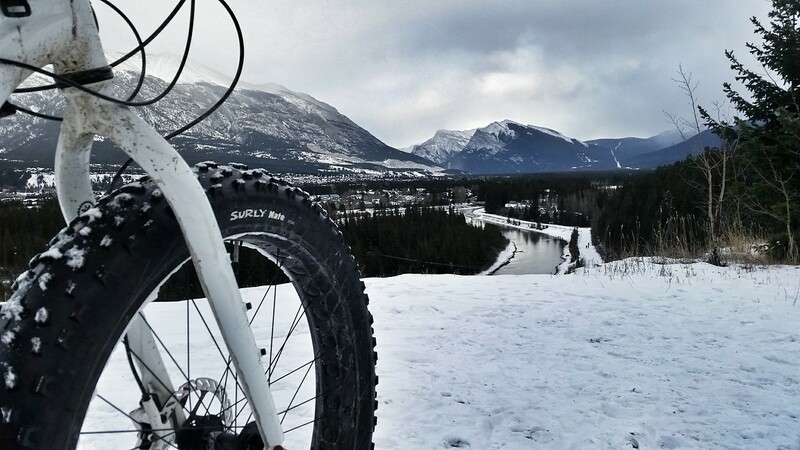 Who gets a flat tyre on a fat bike? Me apparently. Why? Because I was trying to let a little air out, and managed to mess it up entirely, then not realise what I’d done until it was too late. And of course, I hadn’t brought a pump, because I was riding so close to home, and who gets a flat tyre? So, ride aborted, I called the return journey hike-a-bike, and jogged my poor bike home again. 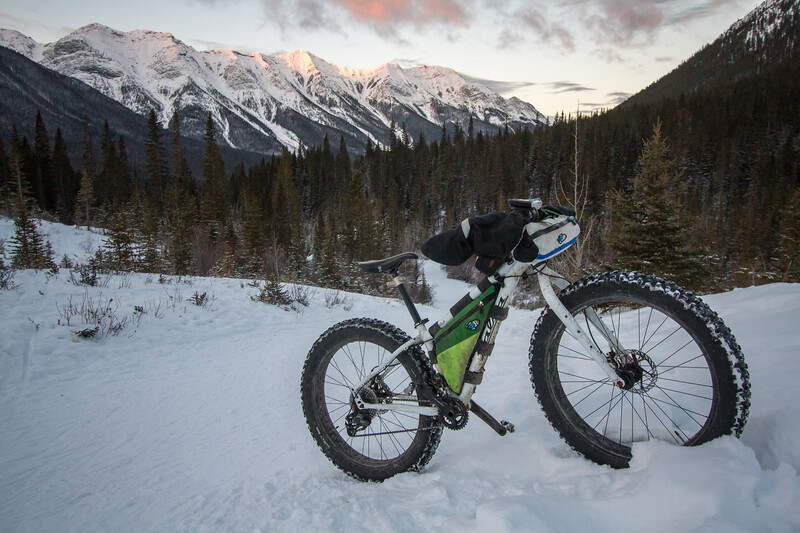 I headed out again that evening, in the snow, and rode up and over the pass and south along the Spray Lakes road. 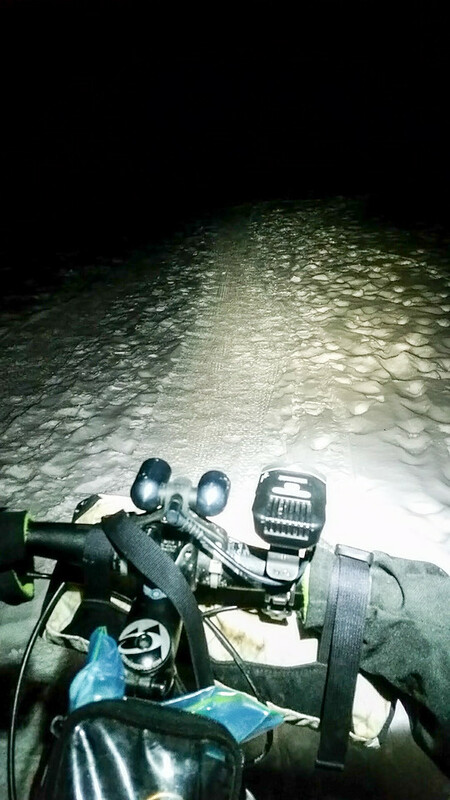 It was to be my coldest night of riding, around-20oC. 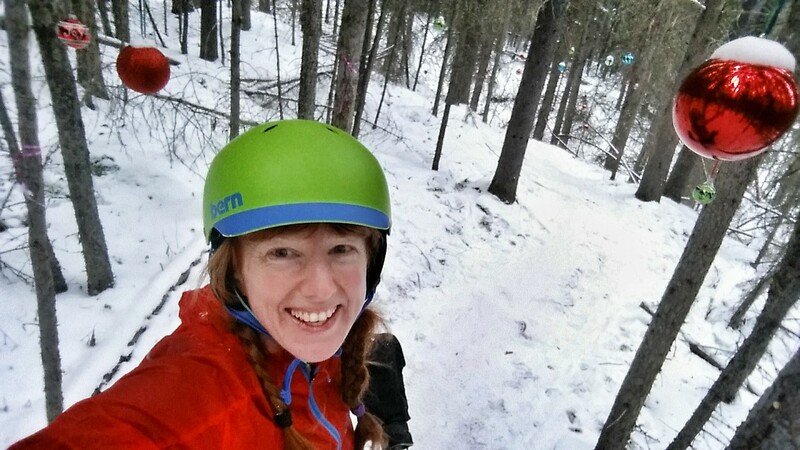 After passing the Nordic Centre there wasn’t another soul on the road. The sky was overcast, no stars, and the world was reduced to the snowy patch of road illuminated by my light. I rationed my headlight, not sure how long it would last, not sure how long it would take me to ride my planned 50km out and back. Having a headlight is reassuring when you want to check the snowy trees at the side of the road to confirm there isn’t a lurking cougar that wants to eat you. But having a flat headlight is worse than having a headlight that’s turned off, so I kept mine off for much of the ride, turning it on when the trees closed in and the road narrowed. I had just enough layers to keep warm, with toe warmers in my shoes, and hand warmers shoved in my crop top and my gloves. Despite that, I felt the creeping numbness in my fingers once or twice, and resorted to riding along swinging my arm, forcing blood back into a recalcitrant pinkie, and then dealing with the ensuing screaming barfies as sensation returned. (Screaming barfies is the ice climbing name for this – when the return of sensation is so painful you don’t know whether to scream, throw up, or perhaps both). I wasn’t planning to ride today. I spent the day at home alone with the Moosling, before heading out for a Christmas potluck dinner (I made my first pavlova, woohoo!). But when we got home at 9.30pm, and there was a chance to go for a ride. Sure, why the hell not. 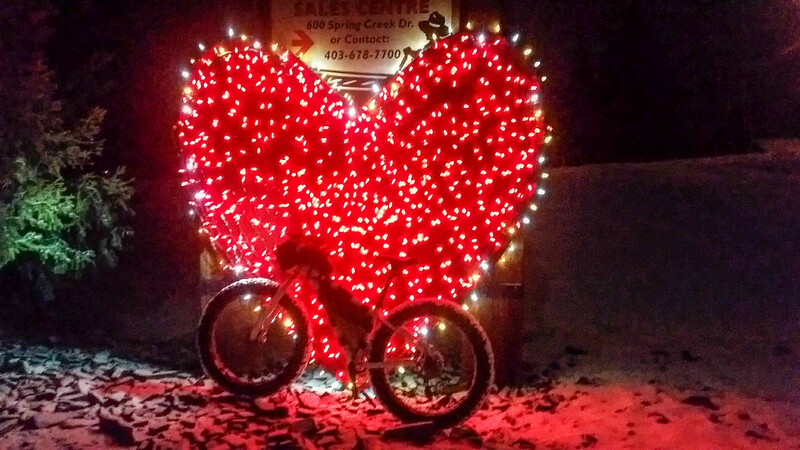 So, stuffed full of Christmas dinner, I went for a 20km ride in the dark, fatbiking along snowy trails around town. On solo parent duty all day today. I could have gotten out at 9.30pm again, but by then I was ready for bed, so I decided I’d make up for it by getting up super early tomorrow. I completely failed to get up super early. By the time I hit the road it was after 8.30am and the sun was already up! But I had the whole day to try and get in as many kilometres as possible. First – up and over the pass and away. 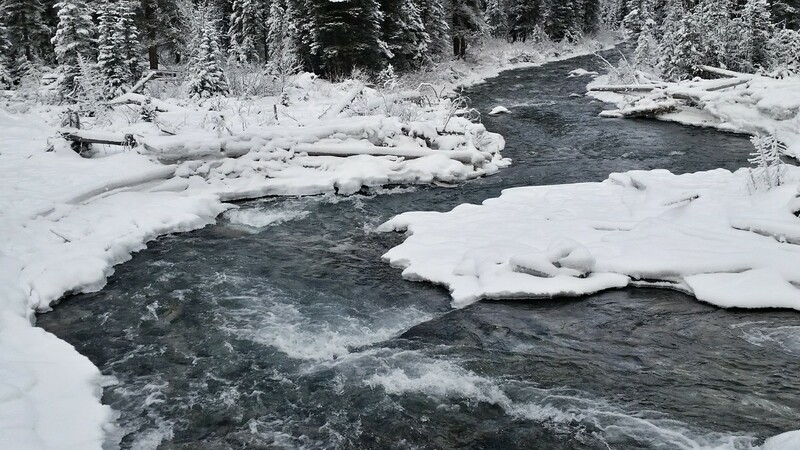 I was going to head along Goat Creek and into Banff, and then see what I felt like from there. Goat Creek was softer than I was expecting! It was the kind of snow where you tend to sink in a little and have to work to keep traction and forward progress. A few times I punched through entirely and came close to spinning out… or did spin out. It was worst between the two main bridges, as I struggled to pick and hold a good line, fighting for every metre. Progress was slow. There weren’t many other people out. I listened to podcasts with one ear, to the crunching churning of my bike tyre with the other. In Banff I made a pitstop at the Wildflour Bakery, overwhelmed by all the people in town – so this is where everyone was! Bag stocked up with extra food, and body warmed, I headed out towards Sundance Canyon. 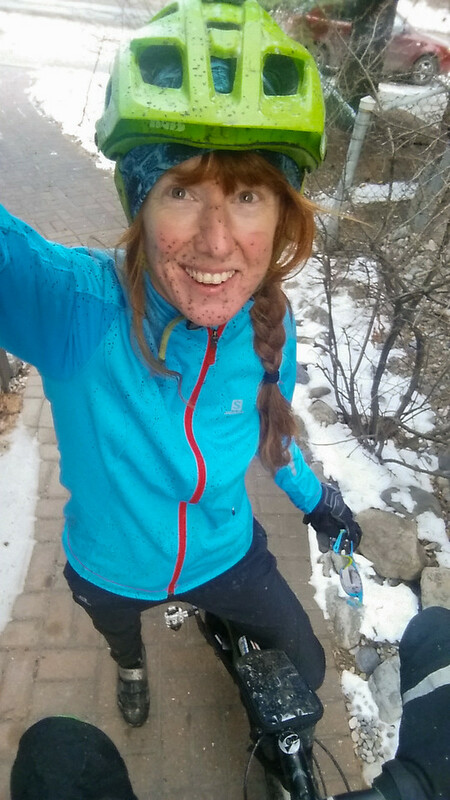 An out and back along the Sundance Canyon road was punctuated with my down skirt getting stuck under my saddle, and me, trapped, falling into a flailing mess into a drift of deep snow. Dignified. After that little episode, I tried heading further west and up to Sundance Lodge, but gave in on the idea as I worked hard through slow, soft snow. The struggle was too tedious, my kilometres too hard won. Instead, I returned to the bakery in Banff again (ahh, more chocolate zucchini loaf, don’t mind if I do!) 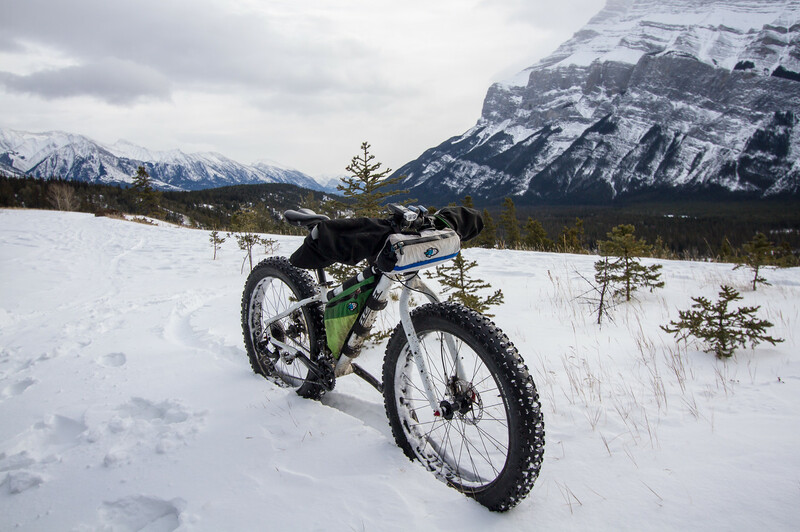 and then hit the road out to Lake Minnewanka, and then onto the singletrack. The sun was getting low in the sky by now. Well, even lower. It barely scrapes the mountains at the best of times in the depths of winter. 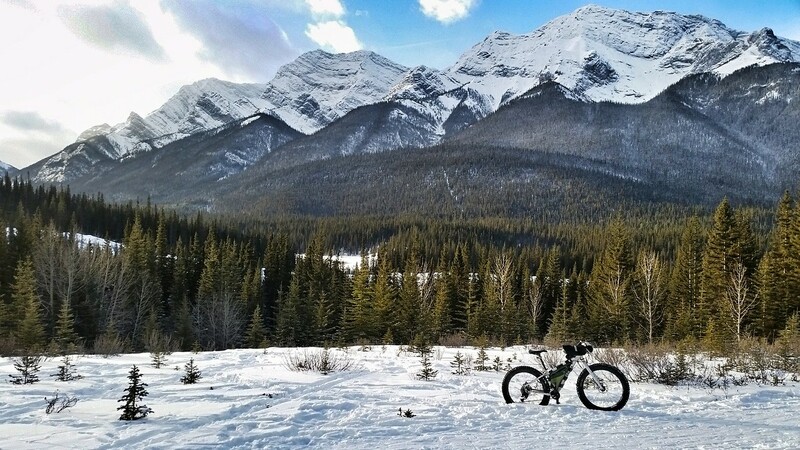 The first few kilometres of Minnewanka singletrack were well packed, highly travelled. But as I rounded the corner and started to descend, things got looser. I then had my best crash of the day, flipping down the lake side of the trail with my bike bouncing after me. Thankfully I was completely fine, although I did startle two riders who had just started heading up the hill toward me. Riding more carefully, I made it to LM8 (the 8km campground) and back unscathed, then, lights on, belted through town and back along Goat Creek once again. In the dark, on slow snow, uphill, hungry, it was a long ride home. Today I posted five separate rides to scrounge an additional 54km, and finally make it to the halfway point of the Festive500. 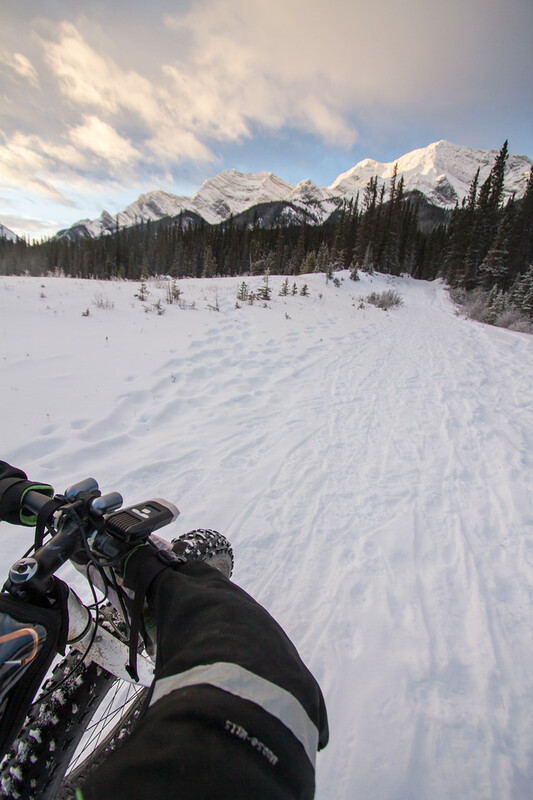 First up, 6km of towing the Moosling to his daycamp with the trail-a-bike mounted on the fatbike. Then another couple of kilometres as I commuted around town for work. But then a solo lunch ride! Singletrack! Riding in daylight! And through the Christmas grotto up at the Nordic Centre. Glorious riding, very tired legs. The climbs were much harder than I remember them ever usually being, but the snowy swoopy descents were wonderful. Then, after work, a failed commute to pick up the Moosling as I snapped my poor neglected, poorly maintained fatbike chain. The walk home with a broken bike in the bitter cold was not fun. 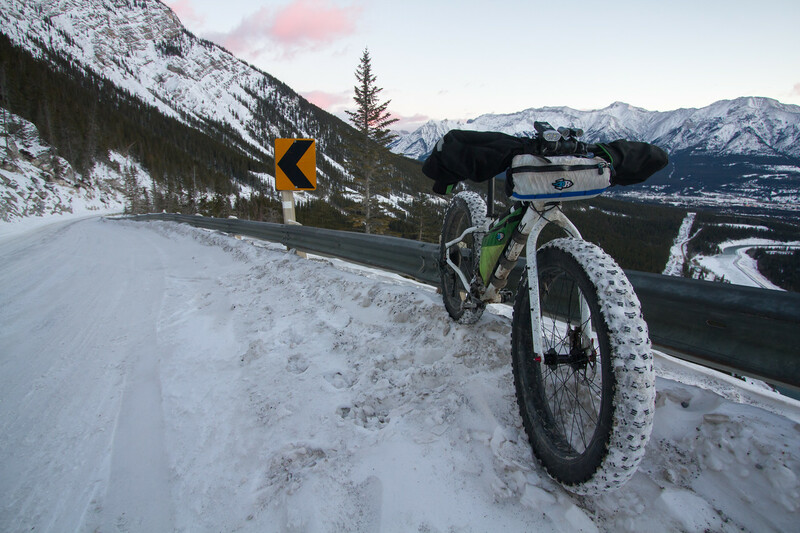 I was still determined to reach the halfway point though – but I couldn’t get out until 9.30pm that night, and still didn’t have a functioning fatbike. So instead when the time came I disappeared into the dark on the studded 29er, heading out along the Spray Lakes road for some mindless kilometres. 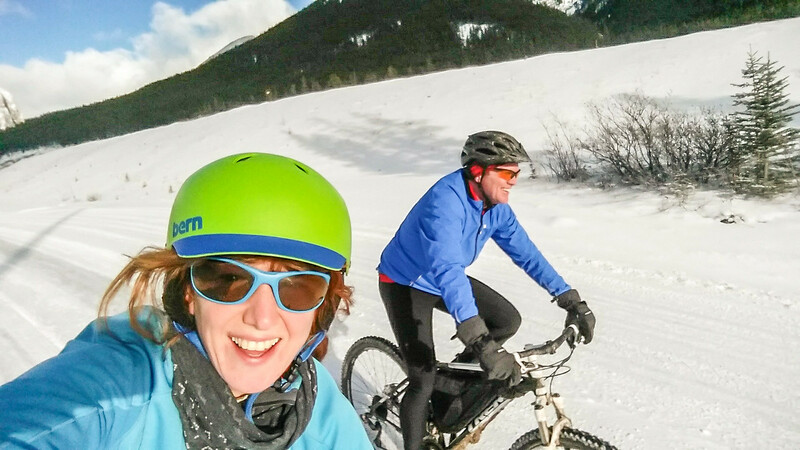 Another lunch ride at the Nordic Centre, this time with actual company! Riding with Marcus, and a brand new chain on my fatbike! Joy! That evening, with tired legs, my fatbike and I headed out into the dark yet again for 42km more of evening riding. I headed up the pass with big dreams, but gave in as I started slogging through drifts in the cold, snowy blowy weather, and descended back towards town. There I started picking off random road loops, trails, paths, and essentially doing whatever I could to gather some easier kilometres. 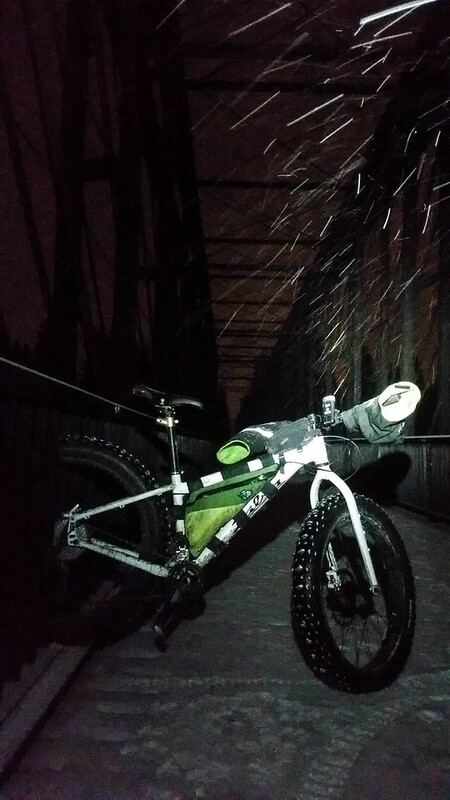 But there are no easy kilometres riding on a snowy night on a studded fatbike. Another lunch ride, more sunny kilometres! This time with Allan, my most usual riding buddy (and also my Strava certified training parnter of the year). A long lunch break was enjoyed, weather and conditions were wonderful. And did I mention it was sunny?! That evening I headed out after work for my penultimate Festive500 pedal, wandering out along Spray Lakes road again because it was in such great shape. I was thinking of heading straight back to my house once I got back into Canmore, but instead I was lured across town to enjoy some apple pie, along with a mug of hot chocolate and Baileys courtesy of Allan and his family (and the other red wine drinking folks who were at the dinner party I crashed!). That all meant quite a few extra bonus kilometres, as well as finishing off the ride feeling warm and rather pleased with myself! A 7.30am departure from home, as I was hoping to be done early. The sunrise pinkened clouds as I rode up the pass. One of the problems with starting in Canmore at sunrise on a clear day is the compulsion to stop and take photos of the damn scenic mountains everywhere. Eventually the beautiful morning light faded and I was actually able to settle down and ride my bike for more than a few minutes at a time. I headed off down the High Rockies Trail. I’d wanted to ride the Spray Lakes Road and jump on the HRT further south, but there was just too much traffic for comfort on the road, so instead I tried to ride the HRT directly from Goat Creek. This was not a good idea. Sure, it initially seemed like a great idea. But gradually the trail was less and less well packed, and then I was struggling to stay upright in deep unconsolidated trail, and hike-a-biking. Damn. Should I turn back? No, it can’t be too much further. And so in that way, I lost a lot of my morning to not many kilometres. Once I got to Goat Pond I jumped on Spray Lakes road and pedalled quickly back to the Goat Creek trailhead, and headed out along Goat Creek once again. There was a lot more traffic today, although it wasn’t really in any better shape, or any warmer. In Banff, I hit up Wildflour Bakery again, where I was heckled by the Australian cashier for the amount of chocolate items I was ordering – I say what’s wrong with chocolate zucchini loaf, hot chocolate and a chocolate spice cookie? Then, out and onto the Tunnel Mountain singletrack. Fun, but my legs didn’t have a lot of go in them. By this point I really only had one speed, and it wasn’t very fast. I kept finding excuses to stop and rest – this was not conducive to finishing my kilometres quickly! Finishing up my Tunnel loop, I returned along Goat Creek as the sun set. It didn’t seem so bad this time, I had skittles with me. After some internal debate (should I ride the Highline? it would be fun, but oh, my legs were tired) I rode out along the powerline trail and along Loki’s (weee! ), out to Three Sisters. It was cold, dark, but I churned through those final kilometres, finishing with a loop around town, and even ending with a bonus kilometre or so padded on just in case. Done! 501km in 8 days. And the stats?